I HEARD a mysterious art dealer turned up at the recent auction of paintings by the Swiss Cottage artist Gordon Bennett. Augustus John and Walter Sickert. 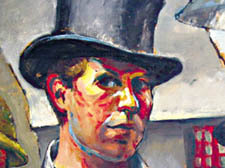 Although Gordon came on the scene decades after Sickert and John, the American art expert believes it is with this illustrious group he belongs. To make this point, I hear, he bagged himself 20 paintings at the auction held at Hampstead Community Centre. Stories about the inimitable Gordon continue to land on my desk. Readers will recall that Gordon had fought with the RAF in the war, survived being shot down and then settled in London after 1945 to teach art and paint in his spare time. A friend of Gordon’s for 50 years Michael Beswetherick told me of how, after walking for four days through enemy lines in the heat of the Libyan desert after crash landing, he finally stumbled into his RAF camp. “He was greeted by his commanding “Where is your bloody plane then?” – a comment, that after being shot down with his crew by German 109 fighters and narrowly escaping with his life, was met with a sardonic nonchalance by the man. There was almost a buying fever at the auction, Beswetherick told me. He bought a portrait of his wife, which went for around £90, and then for one of himself. “I fetched only a fiver,” he revealed. But for such a small sum he may have got himself a bargain. HOW hard is it for a young actor to keep in the mainstream? As easy as riding a bike perhaps? Celia Imre, who has recently appeared in Star Wars and Harry Potter, gave me an interesting insight into her early pre-show routines. “I remember I used to ride my bike here from Fulham every day,” she told me at a book launch at the Open Air Theatre in Regent’s Park yesterday (Wednesday). “I had a part in the Merry Wives of Windsor and before the show I’d ride with my tape recorder in my basket singing to warm up. “I’m not sure what people thought, especially when I crashed into a tree! It turned out that the theatre’s director David Conville had spotted her dancing in a fringe theatre in Birmingham. Soon she was up on stage playing the lusty hostess Mistress Quickly in the summer season. “David had a real knack for spotting people,” she told me. A star-studded cast paid tribute to David Conville who founded the New Shakespeare Company in 1962 and is credited with sustaining the theatre’s success. He signed copies of his new book The Story of the Open Air Theatre. Celebrity actors queued up for copy – as it turns out Conville was quite the headhunter. The Day of the Jackal’s Edward Fox, Ralph Feines, Zoe Wannamaker and Jeremy Irons, former Liberal MP Clement Freud, comedy actor Christopher Biggins, television’s Linda Thorson and Kate O’Mara all performed there as young actors and under Conville’s wing. OFF-KEY hallelujahs and faltering organ recitals are strangers to the two churches led by the Reverend Paul Nicholson, a priest with a musical past. Father Nicholson, of the St Saviour’s and St Peter’s churches in Belsize Park, spent many years as a classically-trained, professional musician, specialising in the baroque harpsichord, I learnt recently. In a free talk at Belsize Library next month, the reverend will recount how he turned to the priesthood during a bout of spiritual restlessness five years ago and took his music with him. He told me he had taken great pains to improve the singing and organ music in his churches, but had dismissed friends’ suggestions he should play the organ as well. “They said I could just do everything – the service and the music – but I wouldn’t want to,” he said. Not according to Primrose Hill clinical psychologist Oliver James who will be fielding the first talk in the annual St Mary’s Church, Elsworthy Road, lecture series next Wednesday. His new book is called Affluenza: Can we be successful and stay happy? He argues there is a depressive middle class illness brought on by too much materialism. “We define our lives through earnings, possessions, appearances and celebrity,” he says. Like the old adage, the richer you are, the less taste you have, it seems that James has hit on something. But let us not forget the misery poverty brings too: perhaps it is just that humans are the grumpiest animals on the planet – the condition John Steinbeck called “the tragedy and miracle of human consciousness”. Reverend Nicholson will be talking on Faith and Music at the Belsize Library in Antrim Road on July 3 at 7.30pm. THOSE who may have thought character actor Richard E Grant will be appearing at the King’s Head theatre next month will be somewhat disappointed. The Withnail and I actor won’t be there in person but his disembodied voice will resonate across the auditorium. It runs with a second play dentity Crisis from July 3 to 29. The plays will apparently take a surreal and ironic look at fear, isolation and insanity in both family and society, at home and at work. figure in Belsize Park, is a very nice bloke, indeed. While chatting with Gary McNulty at a hostelry in the area, Gary, who has three siblings at the Rosary primary school in Belsize Park, asked him he would open its annual fair to be held on Saturday.,And Jon just said Yes – without a thought. “He’s just a very nice kindhearted regular bloke who has always done charity stuff, although he doesn’t talk about it,” Gary told me.